"Diodorus" redirects here. For other uses, see Diodorus (disambiguation). Diodorus Siculus (/ˌdaɪəˈdɔːrəs ˈsɪkjʊləs/; Greek: Διόδωρος Σικελιώτης Diodoros Sikeliotes) (fl. 1st century BC) or Diodorus of Sicily was a Greek historian. He is known for writing the monumental universal history Bibliotheca historica, much of which survives, between 60 and 30 BC. It is arranged in three parts. The first covers mythic history up to the destruction of Troy, arranged geographically, describing regions around the world from Egypt, India and Arabia to Greece and Europe. The second covers the Trojan War to the death of Alexander the Great. The third covers the period to about 60 BC. Bibliotheca, meaning 'library', acknowledges that he was drawing on the work of many other authors. According to his own work, he was born at Agyrium in Sicily (now called Agira). With one exception, antiquity affords no further information about his life and doings beyond in his work. 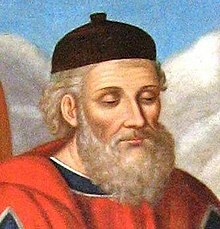 Only Jerome, in his Chronicon under the "year of Abraham 1968" (49 BC), writes, "Diodorus of Sicily, a writer of Greek history, became illustrious". However, his English translator, Charles Henry Oldfather, remarks on the "striking coincidence" that one of only two known Greek inscriptions from Agyrium (Inscriptiones Graecae XIV, 588) is the tombstone of one "Diodorus, the son of Apollonius". Diodorus' universal history, which he named Bibliotheca historica (Greek: Ἱστορικὴ Βιβλιοθήκη, "Historical Library"), was immense and consisted of 40 books, of which 1–5 and 11–20 survive: fragments of the lost books are preserved in Photius and the excerpts of Constantine Porphyrogenitus. It was divided into three sections. The first six books treated the mythic history of the non-Hellenic and Hellenic tribes to the destruction of Troy and are geographical in theme, and describe the history and culture of Ancient Egypt (book I), of Mesopotamia, India, Scythia, and Arabia (II), of North Africa (III), and of Greece and Europe (IV–VI). In the next section (books VII–XVII), he recounts the history of the world from the Trojan War down to the death of Alexander the Great. The last section (books XVII to the end) concerns the historical events from the successors of Alexander down to either 60 BC or the beginning of Julius Caesar's Gallic Wars. (The end has been lost, so it is unclear whether Diodorus reached the beginning of the Gallic War as he promised at the beginning of his work or, as evidence suggests, old and tired from his labours he stopped short at 60 BC.) He selected the name "Bibliotheca" in acknowledgment that he was assembling a composite work from many sources. Identified authors on whose works he drew include Hecataeus of Abdera, Ctesias of Cnidus, Ephorus, Theopompus, Hieronymus of Cardia, Duris of Samos, Diyllus, Philistus, Timaeus, Polybius, and Posidonius. His account of gold mining in Nubia in eastern Egypt is one of the earliest extant texts on the topic, and describes in vivid detail the use of slave labour in terrible working conditions. ^ Diodorus of Sicily In Twelve Volumes by Charles Henry Oldfather (1977), Introduction. ^ Ctesias' Persian History: Introduction, text, and translation by Ctesias by Jan P. Stronk (2010), p. 60. ^ "Diodorus Siculus" entry in the Encyclopædia Britannica. ^ "LacusCurtius • Diodorus Siculus — Book V Chapters 19‑40". uchicago.edu. Ambaglio, Dino, Franca Landucci Gattinoni and Luigi Bravi. Diodoro Siculo: Biblioteca storica: commento storico: introduzione generale. Storia. Ricerche. Milano: V&P, 2008. x, 145 p.
Buckley, Terry (1996). Aspects of Greek History 750-323 BC: A Source-based Approach. London: Routledge. ISBN 0-415-09958-7. Lloyd, Alan B. (1975). Herodotus, Book II. Leiden: Brill. pp. Introduction. ISBN 90-04-04179-6. Siculus, Diodorus; Oldfather, C. H. (Translator) (1935). Library of History: Loeb Classical Library. Cambridge, MA. : Harvard University Press. 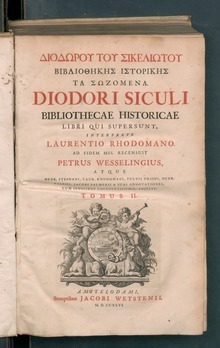 Siculus, Diodorus; G. Booth (Translator); H. Valesius; I. Rhodomannus; F. Ursinus (1814). The Historical Library of Diodorus the Sicilian in Fifteen Books to which are added the Fragments of Diodorus. London: J. Davis. Downloadable via Google Books. Siculi, Diodori; Peter Wesseling (Editor); L. Rhodoman; G. Heyn; N. Eyring (1798). Bibliothecae Historicae Libri Qui Supersunt: Nova Editio (in Ancient Greek and Latin). Argentorati: Societas Bipontina. CS1 maint: Extra text: authors list (link) Downloadable via Google Books. Clarke, Katherine. 1999. "Universal perspectives in Historiography." In The Limits of Historiography: Genre and Narrative in Ancient Historical Texts. Edited by Christina Shuttleworth Kraus, 249–279. Mnemosyne. Supplementum 191. Leiden, The Netherlands: Brill. Hammond, Nicholas G. L. 1998. "Portents, Prophecies, and Dreams in Diodorus’ Books 14–17." Greek, Roman and Byzantine Studies 39.4: 407–428. McQueen, Earl I. 1995. Diodorus Siculus. The Reign of Philip II: The Greek and Macedonian Narrative from Book XVI. A Companion. London: Bristol Classical Press. Muntz, Charles E. 2017. Diodorus Siculus and the World of the Late Roman Republic. New York: Oxford Univ. Press. Pfuntner, Laura. 2015. "Reading Diodorus through Photius: The Case of the Sicilian Slave Revolts." Greek, Roman and Byzantine Studies 55.1: 256–272. Rubincam, Catherine. 1987. "The Organization and Composition of Diodorus’ Bibliotheke." Échos du monde classique (= Classical views) 31:313–328. Sacks, Kenneth S. 1990. Diodorus Siculus and the First Century. Princeton, NJ: Princeton Univ. Press. Sinclair, Robert K. 1963. "Diodorus Siculus and the Writing of History." Proceedings of the African Classical Association 6:36–45. Stronk, Jan P. 2017. Semiramis’ Legacy. The History of Persia According to Diodorus of Sicily. Edinburgh: Edinburgh Univ. Press. Sulimani, Iris. 2008. "Diodorus’ Source-Citations: A Turn in the Attitude of Ancient Authors Towards their Predecessors?" Athenaeum 96.2: 535–567. Siculus, Diodorus. "Library" (in Ancient Greek). Perseus Digital Library. pp. Books 1‑5 only. Retrieved 2017-09-06. "The Library of History" (in Ancient Greek). LacusCurtius. pp. Books 6-10 only. Retrieved 2017-09-06. Siculus, Diodorus. "Library" (in Ancient Greek). Perseus Digital Library. pp. Books 9‑17 only. Retrieved 2017-09-06. Siculus, Diodorus; C.H. Oldfather et al. (Translators). "The Library of History". LacusCurtius. pp. Books 1‑32 only. Retrieved 2017-06-25. Siculus, Diodorus; C.H. Oldfather (Translator). "Library". Theoi E-Texts Library. pp. Books 4‑6 only. Retrieved 2008-10-08. Siculus, Diodorus; C.H. Oldfather (Translator). "Library". Perseus Digital Library. pp. Books 9‑17 only. Retrieved 2017-06-25. Siculus, Diodorus; Andrew Smith (Translator). "Historical Library". Attalus.org. pp. Books 33‑40 only. Retrieved 2014-02-07. Wikimedia Commons has media related to Diodorus Siculus. This page was last edited on 13 March 2019, at 11:17 (UTC).